electrical faults aside, we got a family going on! Yesterday I spent in the studio still working on the dragons. I bought a glue gun a week ago from a high end craft store that shall remain nameless as my previous glue gun, bought sensibly from a hardware store, had been suddenly called to Majorca to attend a family situation. Or at least, that’s what the note it let told me. So I had to buy another one, and since I was nowhere near a hardware store, I bought one from a craft store. A little nervously, I have to admit. It’s been really crappy. 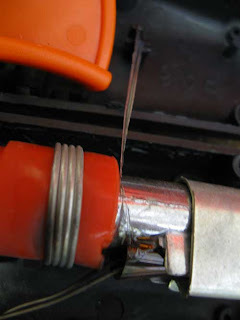 It’s hard to work with, doesnt heat up well, which is pretty important in a hot glue gun, you’d have to agree, and generally has been a pain in the arse. Because I’m a curious sort of girl, when it had cooled down, I unscrewed it to see what had gone on. It was exactly what I figured had happened. .. Glue and circuitry boards should not mix… Notice the charring around the spiral of wire? That was all through the gun. It also knocked out the power points in my studio and although the manager of the building and I spent the next 20 minutes going around to various fuse boxes, we couldnt find the one that had blown. I’m now running anything electrical through a extension cord from the kitchen. Sighs. I was once told that you know you’re having an adventure when you’d rather be home in bed. So I continued the best I could without a glue gun, sewing skin for bodies and heads, stitching in the arms ect. I also decided that the little guy I had created was too small, so I started on making another, bigger Lil Dragon. But eventually I got to a point where I ran out of silver thread, then ran out of red thread and decided it was best to go home. 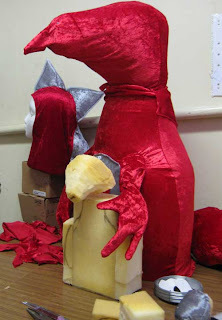 Foreground is the half made Lil Dragon, being hugged by the Mid Dragon (sans facial features, because you need a hot glue gun for that) and at the back you can see the original Big dragon head that came as part of the costume. Of course, it doesnt fit the Big Dragon’s head (the dragon head is much wider than a human or polystyrene one) so I have to make one of those too. This all sounds like a huge undertaking. Good luck & have fun. poor you. glue-gun-less. never a good state to be in. can you take it back to said dodgy well-known craft store and ask for your money back? then head to a decent hardware store for a much better version – like one that actually works and tends not to go up in a puff of smoke? Thanks guys! Becclebee, said glue gun has gone to god, we should take our hats off and let it go 🙂 Plus, I dunno where the reciept is. So I skipped the first part of your advice, but went onto the second and visited my local hardware store. And thus, I re-furnished myself with a hot glue gun that works and likes it’s job. Which makes mine so much easier!